Tony Elumelu, a Nigerian billionaire and philanthropist, has designed an entrepreneurship program that will disburse $100 million dollars in financial assistance to African and African-American entrepreneurs throughout the U.S and Africa. You may have never heard of him, but he's the founder and chairman of Heirs Holdings, UBA Group Plc, Seadrill Nigeria Ltd and Transcorp Plc - Nigeria’s largest listed conglomerate. The company manages investments in financial services, power generation, oil, gas, agribusiness, real estate and hospitality. Back in 2014, Elumelu co-hosted a summit in Washington DC that consisted of nearly 100 African and African-American business leaders. The common theme of the platform was to see to the improvement in the economic stance of Africans, as well as African-Americans, and to create advancement opportunities for all who interacted. 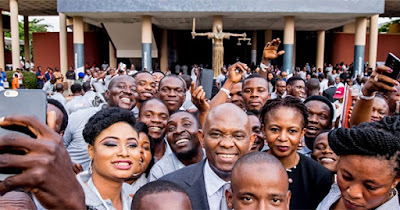 Via his foundation, the Tony Elumelu foundation, 53-year old Elumelu says his vision is to help 10,000 entrepreneurs create 10,000 startups within the next 10 years that generate significant employment and wealth. And what he has is mind is more than simple aid; but will also create a solid partnership between Africa and the U.S. He comments, "I set up the foundation to tackle some of the problems African entrepreneurs face, as entrepreneurship is my passion. I would also like to encourage more of Africa’s high-net-worth individuals to give and support their passions in an institutional manner. It is my belief that home-grown African philanthropy should be setting the agenda for the continent’s development." 3 - Create businesses that can generate at least 1,000,000 new jobs and contribute at least $10 billion in revenues across Africa over 10 years. The foundation's documentary on YouTube has already garnered more than 1 million views.